August Strindberg was a Swedish playwright, novelist, poet, essayist and painter. 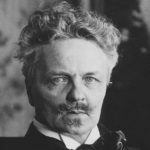 A prolific writer who often drew directly on his personal experience, Strindberg’s career spanned four decades, during which time he wrote over sixty plays and more than thirty works of fiction, autobiography, history, cultural analysis, and politics. A bold experimenter and iconoclast throughout, he explored a wide range of dramatic methods and purposes, from naturalistic tragedy, mono drama, and history plays, to his anticipations of expressionist and surrealist dramatic techniques. "Friendship can only exist between persons with similar interests and points of view. Man and woman by the conventions of society are born with different interests and different points of view." "I always disliked dogs, those protectors of cowards who lack the courage to fight an assailant themselves." "That is the thankless position of the father in the family – the provider for all, and the enemy of all." "Happiness consumes itself like a flame. It cannot burn for ever, it must go out, and the presentiment of its end destroys it at its very peak." "People who keep dogs are cowards who haven’t got the guts to bite people themselves."